If you have created snapshots for a cloud disk, you can use the Disk Rollback feature to restore a cloud disk to a specific snapshot status at a given time point. Rolling back a cloud disk is an irreversible action. Once rollback is complete, data cannot be restored. Exercise caution when performing this action. After the disk is rolled back, data from the creation date of the snapshot to the rollback date is lost. After a system disk is restored, the logon password or the SSH key pair of the ECS instance is retained. You have created a snapshot for the cloud disk, and no snapshot creation is in progress. You have not released the cloud disk. The cloud disk has been attached to an ECS instance and the instance is in the Stopped status. 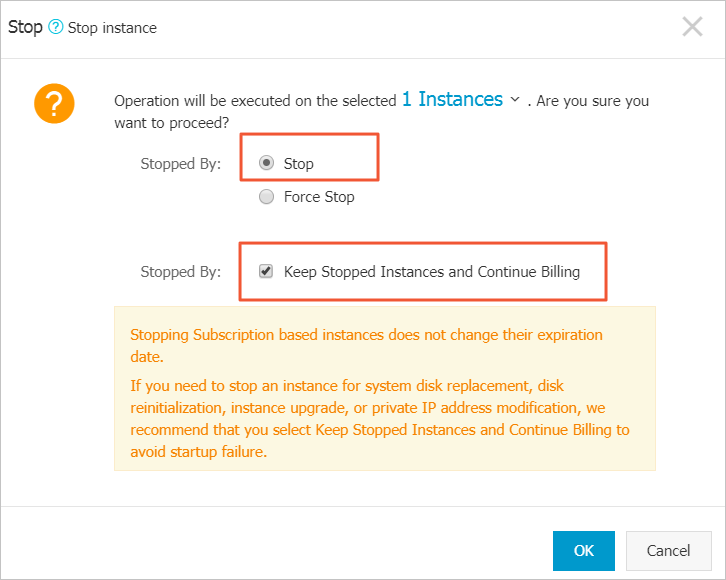 Note For a Pay-As-You-Go VPC-Connected ECS instance, if the No fees for stopped instances (VPC-Connected) feature is enabled, to stop an instance, in the Notice dialog box, click OK. Then in the Stop dialog box, select Keep Instance with Fees, and click OK. If you use the No fees for stopped instances (VPC-Connected) feature, you may not be able to start the instance successfully after changing the system disk. Find the target instance and click its ID to go to its Instance Details page. In the left-side navigation pane, click Instance Snapshots. Find the target snapshot and then in the Actions column, click Disk Rollback. Note If you select Start Instance after Rollback, the instance starts automatically after the disk is restored.